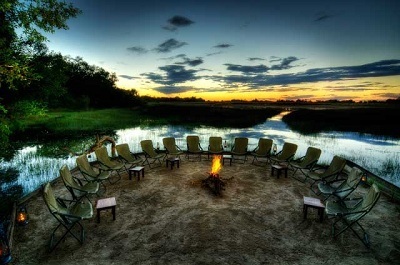 This program combines the magnificent Linyanti swamps with the Okavango Delta and the Moremi Game reserve. You can do both land based game viewing activities and water based activities. This program allows you to experience 3 diverse areas that encompass some of the best game viewing Botswana has to offer. ***This program is ideal to combine with the Victoria Falls. I suggest you can start this tour with a stay of 2 nights in Livingstone at Royal Livingstone (At an additional cost) and go from there to Kasane to start your Botswana program. The Linyanti Swamps lie to the west of Chobe National Park, wilder than Chobe and also known for the large elephant herds. Huge African ebony and marula trees, favourite food for elephant, shade the rivers. This is big game country, with predators such as lion, cheetah, wild dog and hyena regularly sighted, as well as herds of impala, lechwe, kudu, zebra, giraffe, sable, roan, waterbuck and buffalo. The landscape is characterized by grassland vistas dotted with palm forest islands - all very picturesque and open. The three good private concessions here - Kwando, Selinda and Linyanti - offer a seasonal home to game migrating from the grasslands to the south, with the permanent water of the Linyanti/Kwando River drawing the animals during the dry season. Linyanti Ebony, where you will reside for two nights, is situated adjacent to Linyanti Bush Camp, and is in a private concession on the banks of Linyanti Marsh which borders the western boundary of Chobe in the Chobe Enclave. Linyanti Ebony is a small tented camp. All tents are built on elevated decking with views of the endless vistas and lagoons of the Linyanti River system. The tents all have en-suite facilities with a shower and flushing toilet, a comfortable sofa with a writing desk, chest of drawers and a cupboard. The camp's main dining and lounge area is complemented by its own splash pool. Linyanti Ebony offers a diverse range of water and land activities throughout the year. These include game drives in open 4WD vehicles, walking excursions with an armed professional guide, boating and Makoro excursions, and fishing the lagoons. After your final morning game drive and a sumptuous breakfast you are flown by charter plane to your next game lodge situated in the Okavango Delta. The Okavango Delta is exceedingly beautiful. A jewel in the middle of the Kalahari Desert, the Okavango Delta is Africa's largest and most beautiful oasis - an isolated, lush green paradise with some of the richest wildlife in the world. The maze of waterways, lagoons, vast grassy plains and palm-fringed and wooded islands is home to crocodile, hippo, elephant, lion, leopard, hyena, giraffe, wild dog, rare antelope and around 400 bird species. Kanana Camp, is set on the Xudum river deep in the southern part of the Okavango Delta The Kanana concession encompasses a necklace of islands dotted with fig, palm and other trees. Kanana Camp accommodation is in eight spacious twin-bedded Bedouin-style tents with wooden floors and sewn-in windows. These are set on raised wooden decks with glorious delta views. Activities at Kanana camp are varied. The idyllic hillock of islands formed by fertile eroded termite hills makes for exciting game walks and the concession also offers some of the best makoro and boating excursions in the Delta. One of the Southern Hemisphere's most active breeding heronies is on the Kanana concession (with breeding occurring in the spring/summer months from July onwards). The elusive Pel's fishing owl may be spotted if you are lucky. Spin fishing for tilapia, pike or the sharp tooth catfish is also on offer (with equipment available) with the best months being September through to May. However you can also explore the area on day and night drives in open 4x4 vehicles throughout the year. After your final morning activity and a hearty breakfast, you flown by charter plane to your next game lodge situated in the Moremi region of the Okavango Delta. The Moremi Wildlife Reserve is protected tribal land, which forms the eastern boundary of the Okavango Delta. It is often described as one of the most beautiful wildlife reserves in Africa. It combines mopane woodland and acacia forests, floodplains and lagoons and this great diversity of plant life attracts the abundance of animal life for which Moremi is so well known. The largest island in the delta, Chief's Island, is located within the Moremi. The Moremi is famous for its predators, both of the mammal and feathered variety. Please note that night drives and armed game walks are not permitted here (given it is a National Park) but the superb quality of the game-viewing more than makes up for this. Game activities will be mostly land-based in the Moremi. 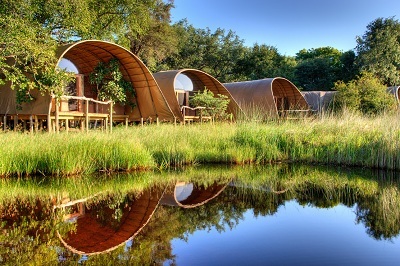 Camp Okuti, is set in the north-eastern part of the Okavango Delta of Botswana, under large shady trees at the edge of Xakanaka lagoon in the heart of Moremi Game Reserve. It's one of the most beautiful parts of the Okavango Delta within close range of shallow flood plains, papyrus swamps and dense riverine forest. Indeed the Moremi is rated as one of the finest game viewing areas in Botswana and indeed Africa. All Okuti tents have en suite bathrooms with toilet, basin and indoor and outdoor showers. The new Camp Okuti has been raised off the ground and all the underlying land has been rehabilitated so that the carbon footprint is low.Camp Okuti safaris are all conducted in open safari vehicles into the Moremi Game Reserve. You can also explore the Delta's channels by motorboat - heading upstream towards the upper delta. Be sure to take binoculars as the birdlife at Camp Okuti is superb, especially in the spring and summer months when the migrants are breeding. An hour's boat ride away is the world-famous heronries of the Godikwe and Xobega lagoons, which attract large numbers of breeding storks and herons.Camp Okuti is quite unusual in the Okavango Delta in that it is family-friendly safari camp and takes children from 7 years and up (though they are a little flexible). There are two family chalets comprising two bedrooms sharing one bathroom for the ideal family safari in Botswana. 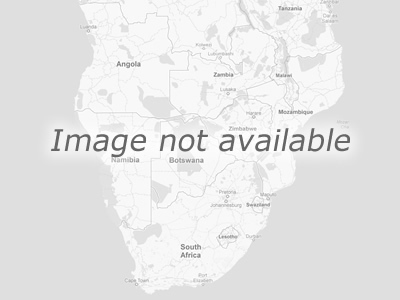 You are transferred by light charter flight from your Okavango Delta game lodge to Maun airport where you connect with your flight to Johannesburg.